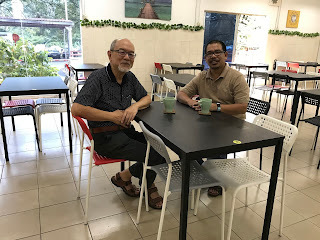 As part of my work in writing a book regarding my experience in MRSM Kota Bharu, I am interviewing former teachers and friends to get their perspectives of the college. I will share some points I gathered during these interviews here and will incorporate them in the book. This morning I was honoured to meet Mr. Aw Dai Kooi, my former chemistry teacher, for coffee. He is also special to me as he was from Machang, the place where I was born. His father started a coffee shop near the police station so that he could attend Sekolah Hamzah in the early 60's. After completing the Lower Certificate of Eduction, his family moved to Kota Bharu where he attended Sultan Ismail College. Later he did his chemistry degree (with honour) at the University of Malaya. There was also where he did his diploma in education. While looking for job he saw an advertisement for teachers at MARA Junior Science College. He was called for an interview and was offered a position as a MARA officer in education. He was asked to report for duty on 1 January 1973. So he did, together with Ms Joyce, his wife. They tried to locate the "junior college" but failed. They eventually went to MARA office and were told that the college was not ready and the designated principal would only be reporting for duty the other week. The principal was En. Tajuddin or was fondly known as Pk Din. It was only a month later where Mr Aw eventually stepped into MRSM Kota Bharu, together with other pioneer teachers such as Cikgu Abdul Ghani and Cikgu Mydin Shariff. The students came in much later and it was an all-boys batch. The MRSM project was headed by Wahab Alwi, a MARA officer who was very dedicated towards education. He told the pioneer teachers to develop the concept of "open class". The brief was so brief that they took the concept too literally resulting in classes not separated by any wall. While learning, students could observe their friends doing the same across their classes. According to Mr Aw, the real meaning of open class was that there was no fixed syllabus and the teachers were supposed to be free to figure out what was necessary. However, MRSM had to adopt the national curriculum like any other school, so the open concept was manifested in the liberal way of teaching and interacting, which defined the MRSM brand those days. There were no fixed classes so that they move from a location to another, just like what students at universities do. Students were not required to wear uniform for two reasons. First to send the message that they are not boxed in a particular way of thinking. Second is to relief parents from buying uniforms, which could be a big deal if they were poor. The focus in the early days of MRSM was to develop the students into a wholesome person. Apart from academic activities, the students were expected to excel in sports and other skills which are important to them later. Homerooms were set up where teachers have to take care of a small number of students like their own brothers and sisters (the age gap was close) or very much later, children. This created a strong bonding between teachers and students which allowed the nurturing process to be more effective. The teachers will teach a subject to a class from the first year until they completed their studies in form five. This allowed them to guide the students throughout their life in MRSM. For some students who were late bloomers, a special class was set up when they proceeded to form four. This class was named after Marie Curie, the only female name adopted other than other names; Darwin, Einstein, Faraday, Mendeleyef, Newton and Pasteur. In essence, the pioneer teachers were given a lot of room to shape the system and they were learning together with the students to grow the MRSM system. The thinking them was if the students were successfully nurtured as a wholesome person, academic excellence was a natural outcome. Only later academic achievements started to be given more emphasis, as an indicator of return to a system where students were carefully selected, all teachers were graduates and the kind of facilities provided, which were considered exclusive at that time. Wahab Alwi later arranged for teachers to be able to pursue masters degree with the cooperation from universities in Illinois. Lectures were brought to MRSM Seremban to conduct classes for the teachers over three semesters. They would then go to the main campus in Illinois for a semester to complete the programme. Mr Aw was in the pioneer batch of MRSM teachers under this arrangement. He taught me chemistry when I was in form five, after he came back from Illinois. I had a distinction in that subject at SPM. I thanked him for the knowledge and also shared that I managed to be in the top 5% in chemistry during my Tertiary Admission Examinations in Western Australia. Mr Aw later was transferred to MARA headquarters in Kuala Lumpur before he was asked to initiate the American Associated Degree project in Kuantan. He later joined MRSM Kuantan as a physic teacher, what he was known for to his students from that college.